Looking for a Used Cruze in your area? CarGurus has 42,780 nationwide Cruze listings starting at $3,450. 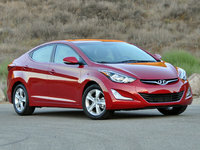 Most people prefer the Honda Civic, Toyota Corolla, and Ford Focus over the Chevrolet Cruze. With the new 2016 Cruze, you owe it to yourself to not be like most people. I’m intimate with the Chevrolet Cruze like few other car writers. I took my best friend’s 2012 Cruze from Baltimore to Las Vegas, past tractor trailers hauling coffins in Kansas and through lonely 100-mph stretches in Utah. Neither of us complained. That’s proof of how good small cars are these days. Now that the second-generation Cruze has arrived, it’s only more reason to revisit this car—well, at least for 400 miles across Connecticut and Massachusetts. Chevrolet now builds some fine-looking cars that can honestly be called pretty. The new Cruze follows in the same stylish lockstep as the Volt and the larger Malibu and Impala. It even shares some Camaro with the now-signature split grille—thin across the top and wide-mouthed at the bottom. General Motors must be proud, or else it wouldn’t have put such a huge Chevy bowtie logo on the trunk lid. Our test car was the top-level Premier, which replaces the LTZ and dresses the car up in the nicest rims and chrome trim. Without that jazz, the Cruze is still sleek. The doors shut with a satisfying, chunky slam. Behind the wheel, large full-color, high-res displays invite the eye, and stitched, soft leather-like material adorns the dash and the chromed air-vent surrounds. Our car had some panel gaps on the lower console, but other than that, it’s amazing that people can still roll around in 2012 Corollas and think there’s nothing better for the money. Hard plastics dominate most of the interior, but they aren’t ragged or grained like a popcorn ceiling. There’s a semi-Cadillac level of detail going into all GM products, and the Cruze is all the better for it. Simple works best. 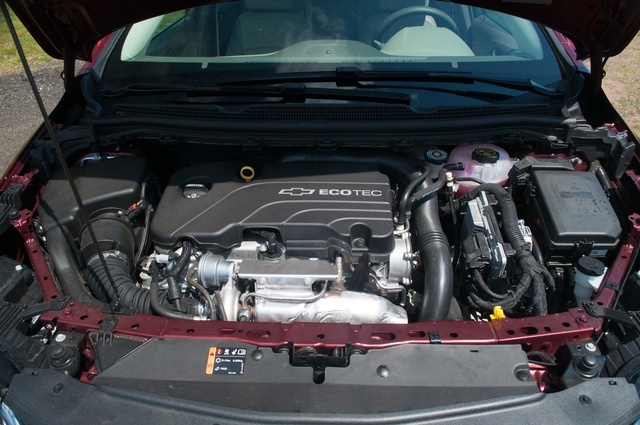 The turbocharged 1.4-liter 4-cylinder that used to be optional for the Eco trim is now the only engine, further refined. It makes 153 horsepower and 177 lb-ft of torque, up 17 hp and 54 lb-ft from the former naturally aspirated 1.8-liter four. With greater grunt from below and 250 fewer pounds to push, this engine never feels like it’s working hard. Our car’s 6-speed automatic left itself in higher gears without bogging the engine, even when accelerating mildly on inclines. Most cars in this class will hunt for lower gears while upshifting constantly to save fuel, leading to abrupt, jerky motions that’ll make you wish you bought a better car. Not here. The automatic’s ratios are nearly perfect, and when a shift is needed, it’s quick and painless. At full throttle, the Cruze builds speed confidently and smoothly. I only wish there was an easier way to select gears, like dropping the shifter to one side to engage a manual mode. 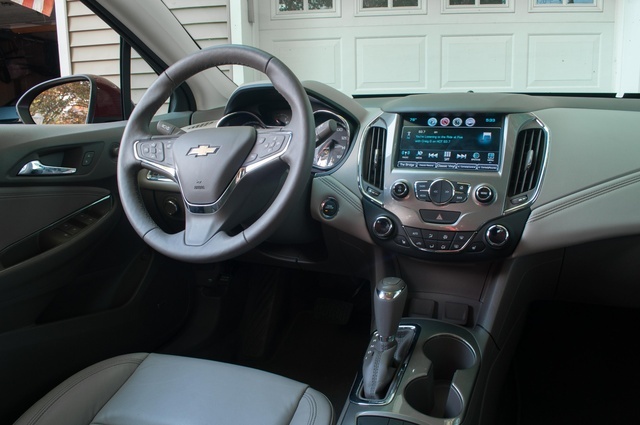 Instead, the Cruze has a fussier two-step process: Push the shifter tab and pull the lever down to “M,” then toggle a rocker switch on the knob up or down. A 6-speed manual is standard in all but the Premier trim. Why not save and learn to drive to stick? Suspension tuning is impressive, with a compliant ride that gives the illusion of a longer wheelbase. The steering isn’t communicative, and the chassis isn’t ready to take a corner like a Focus, so it’s best to enjoy the Cruze at a medium pace. Its 17-inch, 225-mm-wide tires were quite substantial and offered decent grip. What snags this car’s comfortable, unperturbed manner is the engine stop-start system, which can’t be disabled anywhere—not with a button or in either of the substantial option menus in both screens. The engine shudders upon restart and flusters the transmission when taking off. Plus, the air conditioning backs off its chill, all in an effort to save fuel. The best start/stop systems use heavier-duty batteries and starter motors that minimize vibration and allow vehicle accessories to run with the engine off for longer periods of time. The Cruze, like many vehicles with start/stop, is often too intrusive and shuts the engine off and immediately on again, like when you’re about to park. That doesn’t save fuel. But fuel economy is good. My test car was rated at 30 mpg in the city and 40 on the highway. Some Cruze models offer up to 42 mpg on the highway. Over 400 miles, primarily on highways, I averaged close to 35 mpg. GM has often thrown dozens of buttons on its dashes, in similar shapes and with such density as to resemble a 3-D puzzle. Not here. Two rotary knobs for volume, tuning, and menu functions flank six buttons for seek and basic infotainment controls. They’re housed in shiny silver plastic and ringed with chrome. Simple climate controls below in black trim—automatic on our car, along with three-stage heated front seats—turn with a threaded, fine quality. Soft rubber buttons on the steering-wheel spokes control voice recognition, phone, cruise control, steering-wheel heating, and the optional information display in the instrument panel. Leather dresses up the dash and door panels. Nothing is dull inside, although all the glossy bits are extra as part of the Premier trim. You’ll still find a nicely laid out interior on lesser models, but it won’t look this pleasant. The infotainment screen’s angle and slight recess minimizes, but can’t block, the washout effect of direct sunlight. A power outlet and USB port are covered in plain sight just ahead of the shifter, although the blank space above them seems wasted. There’s decent space for four people. 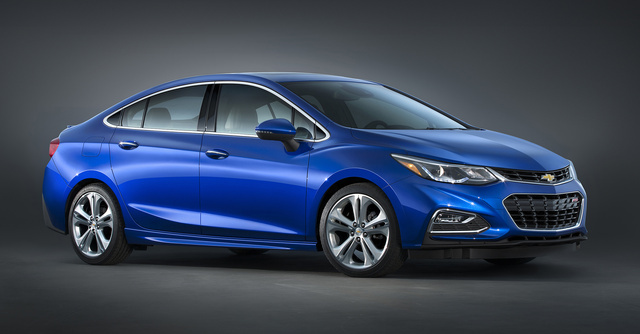 The new Cruze is 2.7 inches longer with a 0.6-inch longer wheelbase than the previous version, which ensures no elbow touching or knocked knees. 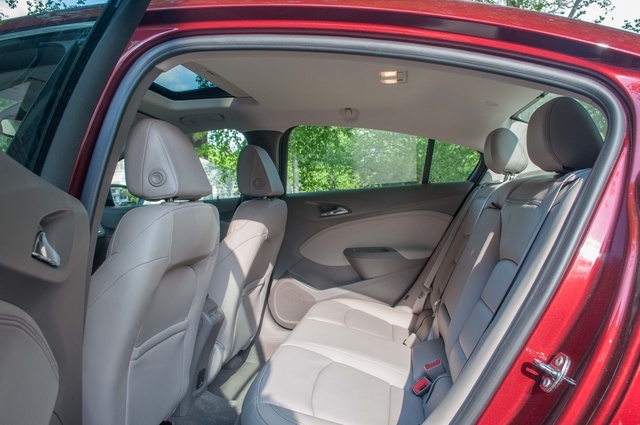 Headroom is generous for a compact sedan, as are the door openings. A BMW 3 Series doesn’t feel any more spacious than the Cruze’s back seat, which is heated for both outboard positions and offers a household outlet. The only oversight is the lack of a middle headrest. 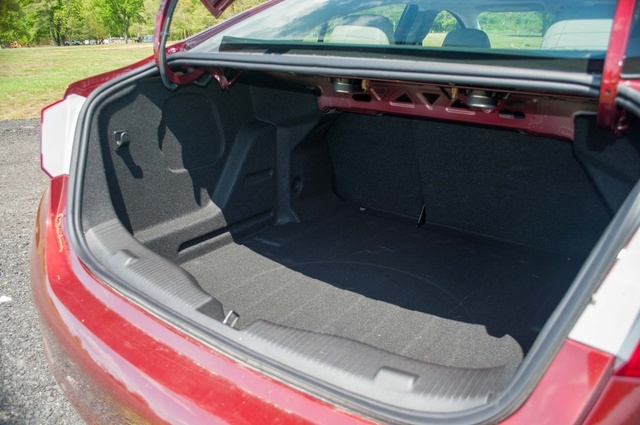 A deep trunk with 14.8 cubic feet of cargo space and a large fold-down opening allows for even more practicality. A spare tire is included only on LT and Premier trims. Large round mirrors work better than the skinny rectangles on GM’s big SUVs, and sightlines are good enough that you won’t need the blurry backup camera. There’s one exterior gripe, and it’s not the pretty sheet metal or the rich-looking Siren Red paint: It’s a flexible rubber chin flap under the front bumper that’s designed to reduce drag and increase fuel economy. What it does is make you believe you’ve scraped your nose when pulling into a lot or going over a speed bump. It wasn’t your fault. Hours before the video shoot, the Cruze reminded me that modern cars are rolling laptops. Mine crashed. 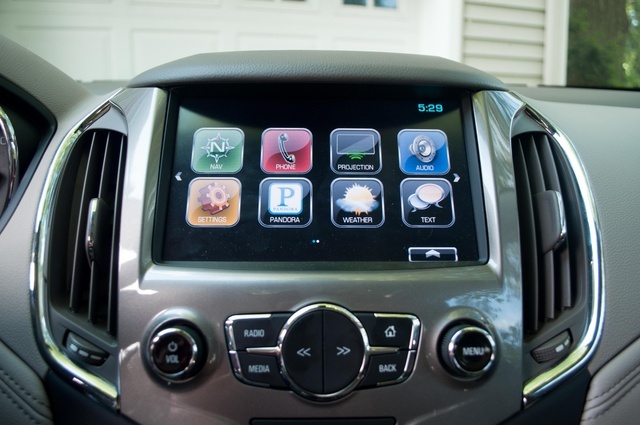 The MyLink infotainment system blacked out entirely, disabling the 8-inch screen and the physical controls beneath it. Nav, stereo, apps, and vehicle settings were inaccessible for 20 minutes, even after locking and restarting the car. Then, like a dog shaking a bug from its ear, the Cruze happily resumed business like nothing ever happened. Were it not for that major inconvenience, I’d have rated this car’s technology higher. As it stands, the MyLink system is quick, logical, and easy to read. The main menu is arranged like tablet icons, which can be rearranged at the driver’s will. Live traffic and single-string address inputs make navigating simple, and like many more-expensive cars, the Cruze’s instrument panel screen lets the driver see and switch between audio, trip, phone, and navigation functions separately. Apple CarPlay and Android Auto are also on tap, along with five years of OnStar emergency services accessible via a smartphone app (which, handily, lets you unlock your own doors without calling anyone). An onboard Wi-Fi connection from OnStar’s 4G LTE cell modem is also included (and free for a few months). A rubber slot in the console, part of our car’s Enhanced Convenience Package ($895), can wirelessly charge compatible smartphones. That package also brings an auto-dimming rear-view mirror, automatic climate control, an express up/down driver’s window, and those heated rear seats with the rear electrical outlet. The 9-speaker Bose stereo, as part of the Sun and Sound with Navigation Package ($1,995), was up to par and worth the upgrade. The Cruze is one of the few cars sold with rear side thorax airbags mounted in the seatbacks. In total, it has 10 airbags, including knee airbags for the driver and front passenger. The National Highway Traffic Safety Administration has the Cruze on its list of vehicles to crash-test this year, and the Insurance Institute for Highway Safety has run the car through just two of five tests as of this writing. Two optional safety packages include forward-collision alert, lane-keep assist, and auto high beams. Those options are available only on the Premier, while blind-spot monitoring, rear cross-traffic alert, and rear parking sensors are available on both LT and Premier trims. Auto-braking and adaptive cruise control are not available. A backup camera is standard. Once the crash-test ratings come in, we'll have a complete picture. But the Cruze at least feels substantial and heavier than a compact car, despite weighing far less than the previous generation. Credit more high-strength steels for bolstering body rigidity. 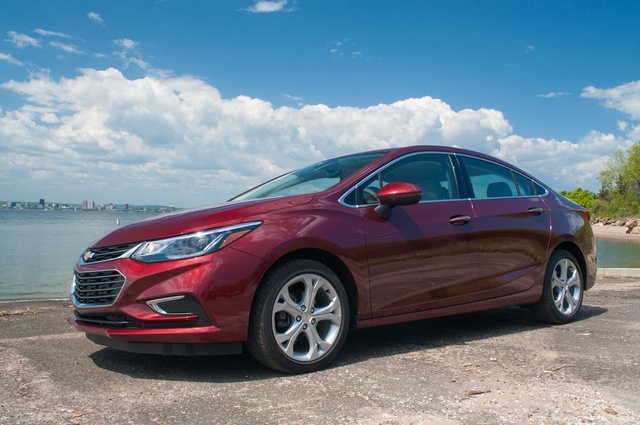 For 2016, Chevrolet continues to sell the previous-generation Cruze as the Cruze Limited. You might score a better deal on one, so consider them both side by side. My test car, without the RS appearance package or the Driver Convenience package, had everything else you can get for $27,250. Fully loaded, a Cruze with the biggest 18-inch wheels can run $29,000 and change. Four trim levels (L, LS, LT, Premier) offer a variety of equipment, all with the same powertrain. The L starts at $17,495 with destination, though as a base trim, it’s available only one way. The LS and LT trims represent the core of Cruze models in the low-$20,000 range with just enough extras, although you’ll need at least an automatic LT (starting at $21,995) to get our car’s navigation and infotainment system as an option. Even the sunroof isn’t available on lesser models. But in this segment, bottom-line prices rule. Thankfully, the Cruze is a stylish, well-equipped compact car that doesn’t skimp on the basics—and it offers a driving experience that’s way more polished than I expected. 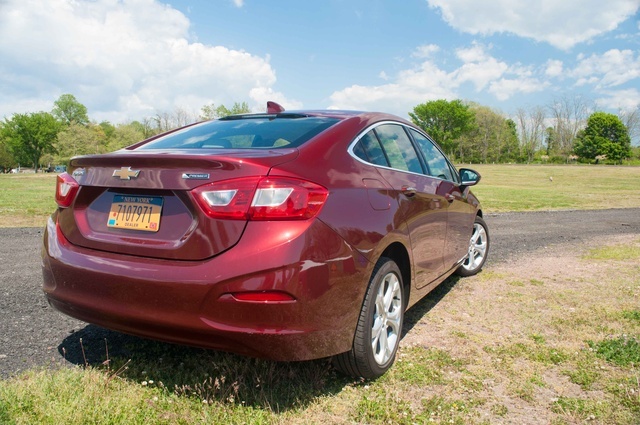 What's your take on the 2016 Chevrolet Cruze? Users ranked 2016 Chevrolet Cruze against other cars which they drove/owned. Each ranking was based on 9 categories. Here is the summary of top rankings. Have you driven a 2016 Chevrolet Cruze? What Could Be Causing A Car To Stall Randomly When Stopped? How Come My 2016 LS ChevyCruze Dose Not Have Cruise Control? I have 2016 LS chevy Cruze that has everything else in it but cruise control. Why?????? ?